First-Time Attendee Orientation: The orientation on June 28 from 4:45 p.m.-5:45 p.m. will put you at ease. From learning protocol tips to meeting other first-timers, it’s a great experience to kick off your first convention. Lunch and Learns: There are two Lunch and Learns to choose from on June 29 from 12:45 p.m.-3:00 p.m. One is for Fundraising and the other is for GFWC Projects. It’s a chance for clubwomen to share their successful moments and inspire each other to adopt great ideas. Everyone is given a chance to speak, so come prepared with an idea to share. Bring pen and paper to jot down ideas from other clubs! Tours: Every year the Convention tours are a big hit, and this year is no different! With options for a Texas History Tour, Day in Waco Tour, and Zip Lining Tour, take advantage of Austin adventures. It’s a perfect way to make new friends! Keep these steps in mind to have a successful Arbor Day experience. Use our press release to spread the word and encourage your community to plant even more trees! Participate in Wear Blue Day on April 5. Take a photo of your club wearing blue and use the hashtag #wearblue. GFWC International President Mary Ellen Brock, Susan Vasu, a member of GFWC Ohio, and GFWC First Vice President Deb Strahanoski. 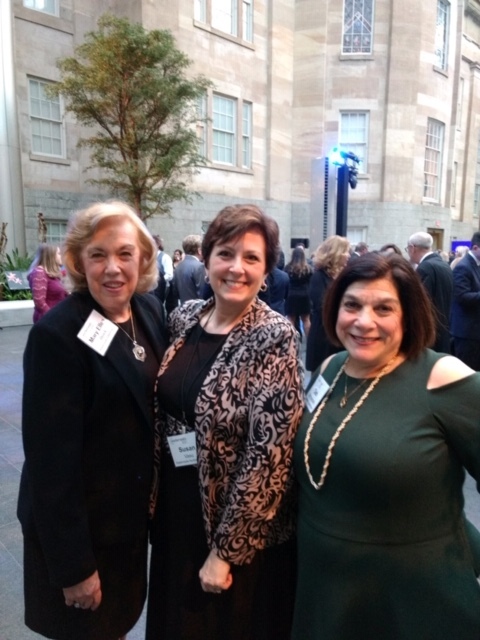 On Wednesday, March 27, GFWC International President Mary Ellen Brock and First Vice President Deb Strahanoski were proud to attend the 100th Anniversary Celebration Dinner of Easterseals at the National Portrait Gallery in Washington, D.C. Previously a partner of GFWC, Easterseals continues to celebrate 100 years of impact by working toward a future where everyone is 100% included and 100% empowered. Our thoughts are with 2018-2020 GFWC Membership Committee Member Susette Redwine on the passing of her mother, Nancy Jane Dalton, last week. Our condolences to 2018-2020 GFWC Credentials Committee member Peggy Barnes on the loss of her mother, Martha “Lavene” Thompson, this week. April’s #ThankYouTuesday theme is “Spring Into Membership” and asks you to think of ways you can put the spring back in your club’s step! Share your ideas on our Facebook post. 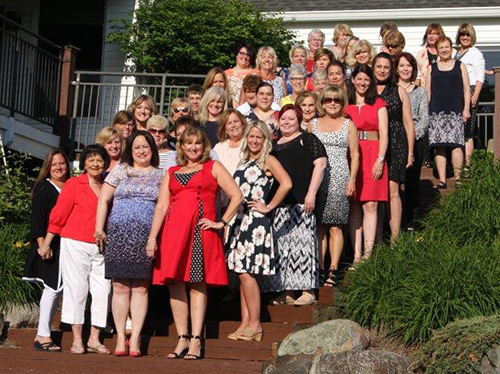 The GFWC Woman’s Club of Colorado Springs (Colorado), GFWC-NH Salem Woman’s Club (New Hampshire), Paradise Valley Junior Women’s Club (Arizona), and the Lake City Women’s Club (Michigan) are featured on GFWC’s Blog. Each constituent unit has its own way of choosing delegates. Hopefully, a club may be able to offer some financial assistance to the delegates representing them. Those eligible to be delegates to the GFWC Annual Convention are detailed in GFWC Bylaws, Article VIII, Section 8.2, Representation. Your state has specific rules for delegates to the state convention. Before each Convention, each club will receive the proposed bylaws amendments that will be voted on at Convention. Sometimes they will also receive proposed resolutions and/or proposed changes to resolutions. It is the duty of a delegate to be familiar with this material before getting to Convention. Optimally, at a club meeting prior to convention, members will be made aware of these proposed amendments/changes and have the time to discuss them. If a club is opposed to one of the suggested changes, it may instruct its delegates to vote against a particular bylaws amendment or resolution. A delegate representing a club must represent the interests of a club and if instructed to vote for or against an issue must do so. In many cases, a delegate is allowed to vote her conscience while still keeping in mind the interests of her club. The proposed amendments to the GFWC Bylaws and Resolutions are in the latest Clubwoman Magazine that each club and subscriber receives. Delegates should bring their magazines with them to Austin, as no copies will be available at the business sessions. 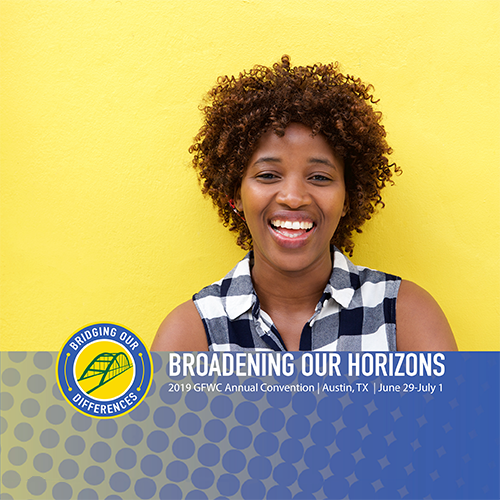 When a delegate gets to Austin, it is her responsibility to register at the GFWC Registration Desk. At that time, she will receive her credentials and meal tickets. Delegates should look through all materials before the business sessions begin. A delegate should be seated at each Business Session ten minutes before the session is scheduled to begin. She should have her Clubwoman Magazine with the proposed changes to Bylaws and Resolutions and paper to take notes. These notes will be very helpful when she goes home and prepares a report for her club. At the first general club meeting after Convention, she should report the business that was conducted, as well as the other activities that make a GFWC Annual Convention so much fun. Whether you’re having a picnic to celebrate Federation Day or you’re having a membership recruitment event, GFWC’s party kit makes it easier than ever to be a hostess. 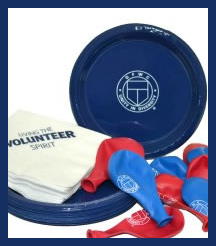 For $10, you can get 20 plates, 20 napkins, and 10 balloons, all branded with GFWC spirit! Get your party kit in the GFWC Marketplace.